Stamp the dress form and corset using hybrid ink onto watercolor paper. Color your images using Distress pens. 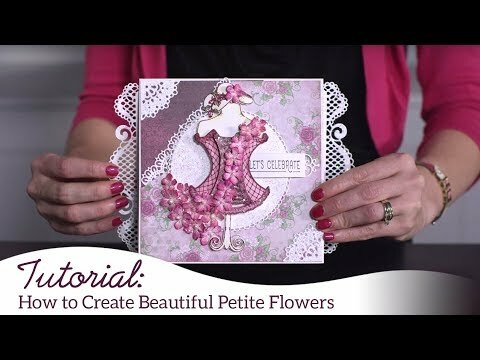 Die cut and glue to your card front. Stamp 6 Oakberry blossoms using the Crimson Red ink onto one of the sheets of paper from the collection. Also stamp one petite floral flower. Now add some color by using your Copic pens and add more Crimson Red ink to your flower edges to give them depth, die cut and shape using the Deluxe Flower Shaping Kit. Add some Frosting Powder to your flowers for added sparkle. Select similar shade of beaded stamens, color with Copic pens to match. Pierce the center and add the colored stamens, adhere. Now stamp your leaves from the Oakberry set using Leaf Green Archival ink onto green designer paper. 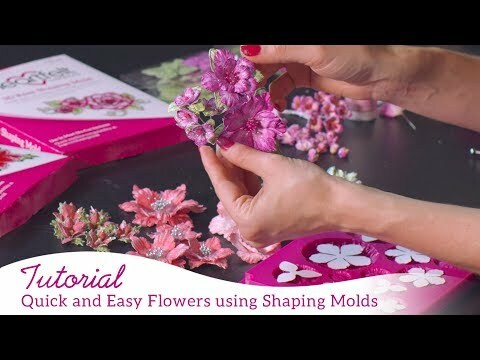 Shape using Deluxe Flower Shaping kit, add Frosting Powder and glue to your flowers. Cut a sentiment from the paper pad. Arrange all as shown and adhere.